Originally a trail leading up the Santa Fe River canyon into the Sangre de Cristo Mountains, the route which would become known as Canyon Road was used by local Pueblo Indians to access ritual sites, and to travel to the Pecos Pueblo. The footpath was later used by woodcutters and others to reach forest resources, developing over time into a narrow residential lane running along the Santa Fe River. A map dated 1778 depicts the lower portion of Canyon Road as an unnamed street surrounded by fields. Over the last century, Canyon Road has maintained it's authenticity and historic charm while evolving into a world renowned art district, and one of America's "Top Ten Streets." A great many of its 250 year old homes and gardens remain, now converted into galleries, studios, shops, and restaurants. Throughout much of its history, Canyon Road was a quiet farming community on the outskirts of Santa Fe. But in the mid 19th Century, artistic and technical changes so dramatic were occurring in the European art world, that they would ultimately have a tremendous impact on Santa Fe. A group of French painters created a new and vibrant style of painting. They left their still lifes and portraits to paint in the outdoors, attempting with rapid, small strokes to capture the play of sunlight on the landscape. This technique would later be known as Impressionism, gaining great success among art collectors in America. The popularity of painting en plein aire (or in the open air) increased dramatically when paints became available in tubes in the 1870s. Previously, artists mixed their own paints by grinding minerals, flowers, seeds, and other vegetation and mixing the resulting pigments with linseed oil. It was also during this time that the French Box Easel was invented. With telescopic legs and built-in paint box with palette, this easel folded into the size of a briefcase, making treks to meadows, forests and hillsides far less arduous. 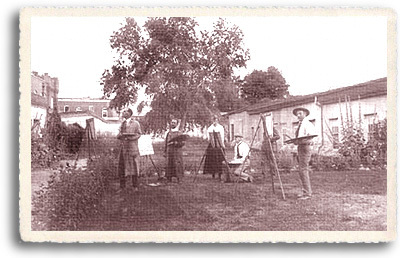 American painters flocked to Europe to learn the new techniques and paint in the parks of Paris and the outlying countryside. And when they returned to America, they may have put a definitively American twist on the style, but they brought their love of this new, free art form with them. And from that passion was born American Impressionism and an American tradition of Plein Aire painting. While some painters chose to live and work in New York, most preferred to paint the countryside. Art colonies began to spring up all over New England, rural New York, Pennsylvania and Canada. And in the late 1800s, with the completion of the transcontinental railway system, artists began to explore the West, discovering a wealth of natural beauty to inspire them. Those who landed in Northern New Mexico also found the unique and magical light of the high desert, and the colorful rituals and culture of the Native peoples and the Spanish colonists who preceded them. They brought news of the light, the climate, the beauty of the land, and their Wild West adventures back to New York, and more artists followed. By the turn of the century, a small number of artists were living in both Santa Fe and Taos, both of which would become full-fledged art colonies in the coming years. One of Santa Fe's first art exhibitions was held in 1893 by Taos painter, Warren Rollins. At that time, there were only a few painters in Santa Fe, but Rollins felt there might be a market for his work there. He was given permission to hold his exhibition at the Palace of the Governors, which proved to be a great success. Rollins ultimately stayed in Santa Fe, establishing the Santa Fe Art Club, and teaching classes at the Palace of the Governors. The Taos Founders (artists who founded the Taos Society of Artists) had arrived at the end of the nineteenth century, some 20 years before the Santa Fe artists. They were a group of highly educated Easterners in the tiny, remote village seventy miles north of Santa Fe. There was a great deal of interaction between the artists of Taos and those of Santa Fe, and many stayed in both towns before choosing their new home. The Taos and Santa Fe groups both consisted largely of artists who were well known and even renowned before they came to New Mexico. They were not cut off from their Eastern acquaintances or markets, as many of them either divided their time between the East Coast and New Mexico, or made annual trips. In this way, they brought New Mexico to the East Coast at the same time that they were bringing fine art to the West. John Sloan, one of several artists relocating to New Mexico who had exhibited at the famed New York Armory Show of 1913, purchased a home on Garcia Street off Canyon Road where he spent every summer for twenty years, while he continued to spend his winters teaching in New York. The climate also proved to be a great boon to the fledgling art colony in Santa Fe. Artists who suffered from health problems in the cities of the East Coast sought the clean, dry air of the Southwest. Those who suffered from tuberculosis came to Santa Fe's Sunmount Sanatorium for treatment, and many decided to stay. One such transplant was prominent portrait painter Sheldon Parsons, who moved to Santa Fe from New York in 1913 for the beneficial climate. He and his daughter later took a care taking position at the home of painter Gerald Cassidy on Canyon Road. As time went on, more artists found their way to New Mexico, and to Canyon Road. In 1920, Olive Rush became the first professional female artist to relocate to Santa Fe, purchasing a 100 year old home on Canyon Road, which she completely restored. The Olive Rush Studio is one of the few remaining adobes in Santa Fe which retains its original mud-plaster walls, and is an excellent example of the type of studios established by the artists of Canyon Road. Within the next few years, the establishment of the Canyon Road area as the heart of Santa Fe's artist colony was cemented by a period of great activity and exceptional work. At that time, a group of painters came together who were known as Los Cinco Pintores, or the Five Painters. They were Freemont Ellis, Willard Nash, Jozef Bakos, Will Schuster and Walter Mruk. The Five Painters built homes adjacent to each other on Camino del Monte Sol, and showed their work collectively for several years. Their styles were quite diverse, but for a group so small, their influence was great. They came to be known affectionately as "the five little nuts in the five adobe huts." At the time of their first show at the Museum, Santa Fe had a population of 7,000, which included 15 artists. While many Santa Fe artists worked in a traditional style, there was a contingency of painters who were excited by new developments in the art world. A modernist movement developed in New Mexico. Cubist and abstract elements started to appear in paintings with Southwestern themes, at times taking over the work entirely. From this point on, work produced by Santa Fe's art colony would show more and more diversity of style. 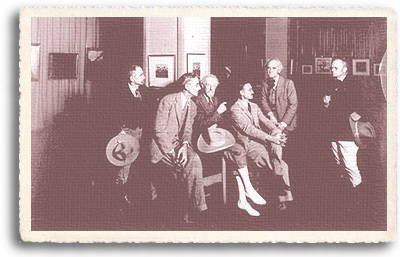 With the reputation of Santa Fe as a haven for artists growing, they continued to come, with more and more of international and national fame among them. There were many art colonies springing up in beautiful rural America during this time, but the Santa Fe Art Colony thrived and grew due in great part to the Museum of New Mexico. At that time, the Museum was headed by Dr. Edgar L. Hewett, who was himself an artist as well as an archeologist. He and his colleagues showed great foresight in establishing a support system to attract and keep fine artists in the area. They provided studio and exhibition space for newly arrived painters, so they could work and establish themselves while they looked for homes for themselves and their families. There was not yet any organized art market with respect to galleries and art dealers. Artists arranged shows directly with the Museum. Work was purchased through the museum showings, or sent to galleries back East. This provided a living for newly arrived artists in Santa Fe. In the late 1920s, artists arrived in Santa Fe seeking respite from the economic gloom which a year later would become known as the Great Depression. Throughout the Depression, more artists moved to Santa Fe and to Canyon Road, creating a close-knit community. Accomplished violinist, painter and writer Alfred Morang and his wife Dorothy came to Santa Fe in 1937, his studio ultimately becoming a popular place for artists to gather. Morang authored an Art in the News column for the Santa Fe weekly newspaper, as well as hosting a radio program which aired for 15 years. His Morang School of Art was an influence on many young New Mexico artists, and every Saturday night, the Morangs hosted an open house which few Santa Fe artists missed. Throughout the 1950s and 60s artists continued to come to Santa Fe, many settling on Canyon Road. With the increasing traffic, the dirt road was becoming quite a problem, often impassable due to deep mud, and in 1964, it was paved. 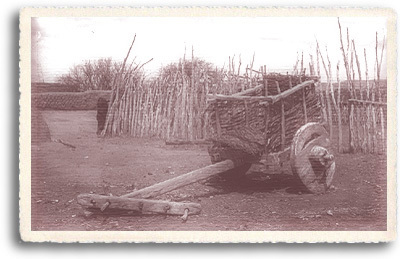 This brought more shops and galleries to the old adobe homes, and by 1969 it is estimated there were 500 professional artists living and working in Santa Fe, with about 30 studios and galleries located on Canyon Road. Canyon Road was the perfect venue for the carefree and creative sixties lifestyle. Stories of bohemian parties on Canyon Road in the 60s abound, including one party for which a local artist provided the food--a wheelbarrow full of refried beans! To accommodate the transformation of Santa Fe into an art center while preserving its architectural heritage, the city made two important planning decisions. First, it adopted the Historic Style Ordinance, which prevented permits being issued for buildings that did not reflect Santa Fe's architectural heritage. Second, the city established Canyon Road as a Residential Arts and Crafts District. This zoning technique allowed local artists to sell their works from their homes. For today's visitor, a walk along Canyon Road between Paseo de Peralta and Cristo Rey Church is a walk back through time, on a road of one story structuresauthentic adobe architecture interspersed with Spanish Pueblo Revival and American territorial styles. This narrow, winding road with equally narrow sidewalks provides a uniquely intimate and inviting experience for pedestrians. Centuries-old walled gardens invite visitors into serene courtyards, with dark, cool gallery interiors waiting beyond. 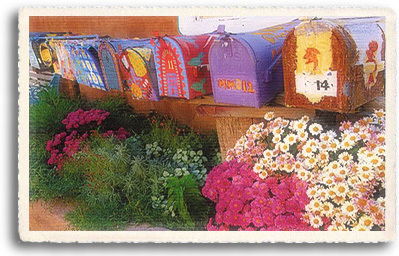 Old growth trees shade the streets, and everywhere wildflowers and sage meet the eye, punctuated by latilla coyote fences, hand hewn wooden doors distressed by time and weather, and brightly colored mailboxes. Canyon Road is the perfect living example of authentic Southwest style. Today, the dozens of galleries which line Canyon Road feature traditional art, art of the American West and contemporary art alongside Native American and Spanish arts and crafts. And while visitors will find a great deal of traditional painting and sculpture here, there are antiques, collectibles, crafts, fiber arts and clothing. And there is a lot of folk art and whimsy. Kinetic sculptures catch the breezeand the eyeoutside one gallery. A life-size stone dog with a biscuit on his nose greets visitors just inside the door of another. 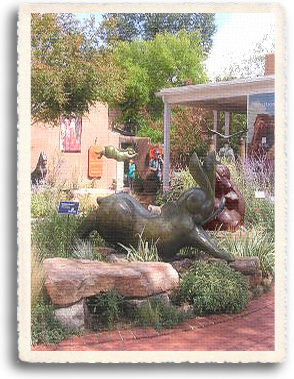 And a favorite of many is a jackrabbit the size of Babe the Blue Ox tucked into a tiny courtyard. Much of Canyon Road's art is displayed outdoors. Sculpture gardens fill courtyards and run the length of portals up and down the road. Side roads and walks through courtyards lead to more galleries and more sculpture gardens, many revealing hidden treasures! One such gem is the cottage garden reproduction of the one originally planted by Adolph Bandalier in the 19th Century. The centerpiece of this garden is a century-old peony bush. You will find this beautiful little garden behind the Historic Santa Fe Foundation. Another New York Armory show exhibitor, Randall Davey, relocated to Santa Fe, making his home at the very top of Canyon Road, bordering on the Wilderness. His home was left to the Audubon Society, and is now a bird sanctuary. Visitors to the Davey home enjoy the delightful combination of exhibits and nature trails. Locals and visitors alike enjoy Friday night "Art Walks" during the summer, with exhibit openings, artists receptions and open houses at many of the Canyon Road Galleries. Canyon Road restaurants and bars offer world-class music, including Spanish classical guitar, flamenco, jazz, and blues. And don't miss Canyon Road at Christmastime! Christmas Eve on Canyon Road is a delight to behold, with farolitos and bonfires lighting the walks, gallery open houses and caroling. Come to Canyon Road prepared to spend a few hours. You can pick up a map at most hotels and galleries in Santa Fe. Wander through the galleries, and stop for a bite at one of the numerous restaurants or bars, especially one with a patio or portal where you can keep an eye on the goings-on. In The City Different, one of the arts is people-watching.